« Darker » is probably the most convenient word to describe the Dalton Bond. 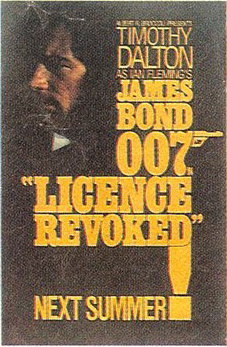 After the jokes of Sir Roger Moore, Dalton set the tone for a more realistic and more intense 007. We can already see that in his first James Bond, The Living Daylights, released in 1987. But it’s even more obvious in his second (and alas, last) film: Bond leaves the MI6 to avenge the attack on his friend Felix Leiter by killing the latin drug dealer Franz Sanchez. And most of the advertisements are based on that precise idea. Like this one for example. 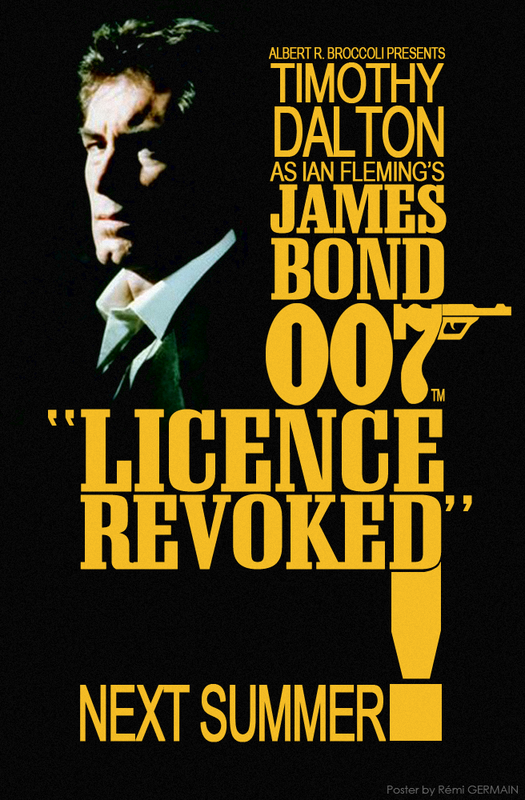 Only two main colours: black and yellow, the face of Dalton in the background, and a strange 007 logo. After hours of research online, it seems this logo was only used for these posters. As this one don’t exist in high quality, I had to quickly do it under Photoshop. The rest of the poster was really easy to do. One of the few problems (as always) concerns the fonts used. It’s usually fonts used especially for a movie, and can’t be found online. So, I had to play with various other fonts. I used Arial Narrow for the names (Sometimes, the basic Windows fonts can be useful), and Schadow BlkCn BT for the rest. This font is actually the one used for The Living Daylights, so I had to change it a bit. Of course, the other problem was the picture. I think I’ve never seen that picture of Timothy Dalton before. Or maybe it’s a heavily modified picture to make it look darker than usual. Anyway, I’ve found a similar picture, where Dalton is facing the camera. ← [GoldenEye] – Teaser Poster.